Coming from the North: Take I-75 South to exit #3 (Hopple Street). Once off the exit, go left on Martin Luther King. Take Martin Luther King to Jefferson Avenue, then take a right on Jefferson. Take a right onto campus at Corry Street, Corry Street will run you directly into the CCM Garage. The Richard E. Linder Center is off to the Right. Coming from the Northeast: Take I-71 South to Exit #3A (Taft Road), You merge onto William Howard Taft off the exit, you will then turn right on Jefferson Avenue, then left onto campus at Corry Street. Corry Street will run you directly into the CCM Garage. The CCM Garage is at the south end of the Stadium and The Richard E. Linder Center is off to the Right. Coming from the South: Take I-75/I-71 North. Crossing the bridge from Kentucky to Ohio follow I-75 North to Exit #3 (Hopple Street). Once off the exit, go right on Martin Luther King. Take Martin Luther King to Jefferson Avenue, then take a right on Jefferson. Take a right onto campus at Corry Street, Corry Street will run you directly into the CCM Garage. The CCM Garage is at the south end of the Stadium and The Richard E. Linder Center is off to the Right. Coming from the West: Take I-74 East to I-75 South to Exit #3 (Hopple Street). Once off the exit, go left on Martin Luther King. Take Martin Luther King to Jefferson Avenue, then take a right on Jefferson. Take a right onto campus at Corry Street, Corry Street will run you directly into the CCM Garage. 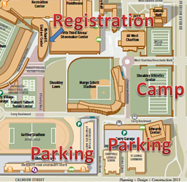 The CCM Garage is at the south end of the Stadium and The Richard E. Linder Center is off to the Right. The Closest Hotels to the Campus and Camp are : the Kingsgate Conference Center, The Fairfield Inn and Suites Uptown Cincinnati, and the Hampton Inn Uptown. All Three are within a block of Campus. The University of Cincinnati football camps are held on campus at the University of Cincinnati. They take place at the football complex including the Jefferson Avenue Sports Complex. . The University of Cincinnati is assessable by many major highways, by the Cincinnati/Northern Kentucky International Airport, or the Cincinnati Bus Terminal. Overnight campers needing transportation from the airport or bus station must make arrangements with the camp staff at least one week prior to the camp.